I love when the family "comes home" for the holidays! I have such a wonderful time with all my nieces. The best part of being together is that they LOVE the camera! Now it's your turn to take the June HOMECOMING Challenge. See all the details HERE! Girls just wanna have fun! This is a really sweet layout and is very pretty in pink. Great lo! Love all the layers!! So so pretty and love the colors!!! I love those embellishments! Love the colors and great page design. Nice job! What a great LO, I love the colors and the embellishments you used are so cute! I LOVE all those flowers and the colors are fantastic. Beautiful! 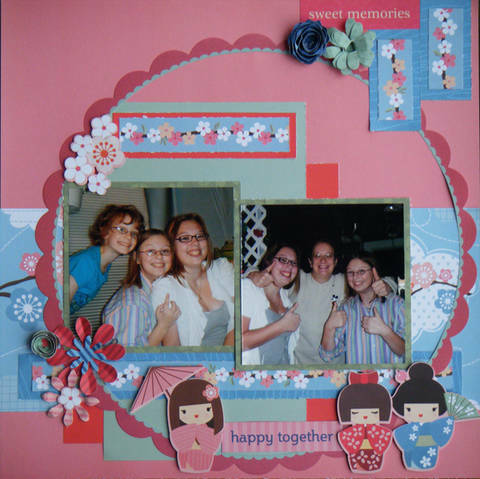 June HOMECOMING Challenge by Wendy C.
June HOMECOMING Challenge by Debra P.